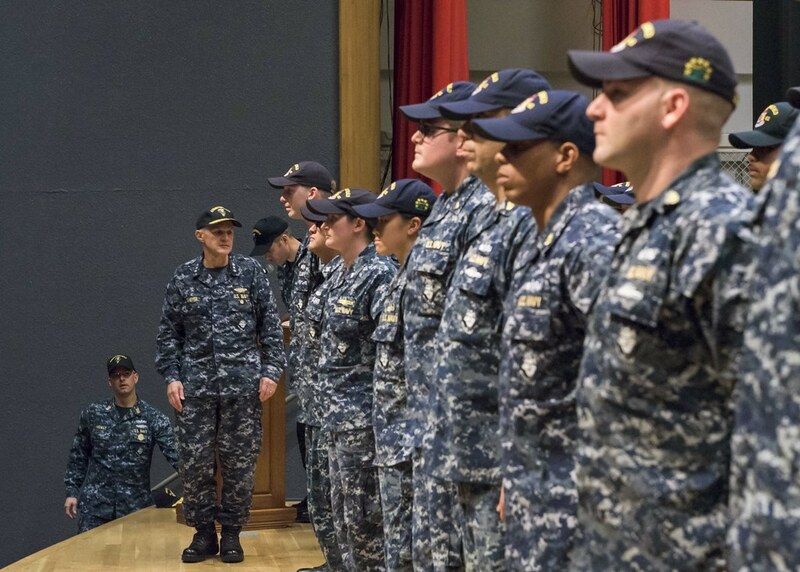 YOKOSUKA, Japan - Thirty-six Sailors who distinguished themselves for their bravery and contributions to damage control efforts aboard the guided-missile destroyer USS Fitzgerald (DDG 62), were recognized at a ceremony, Oct. 20. The Navy announced Sept. 22 that the guided-missile destroyer USS Fitzgerald (DDG 62) will be changing homeport from Yokosuka, Japan to Pascagoula, Mississippi effective Dec. 15. YOKOSUKA, Japan (NNS) -- The Arleigh Burke-class guided missile destroyer USS Fitzgerald (DDG 62) during a change of command ceremony at Commander, Fleet Activities Yokosuka, Aug. 25. 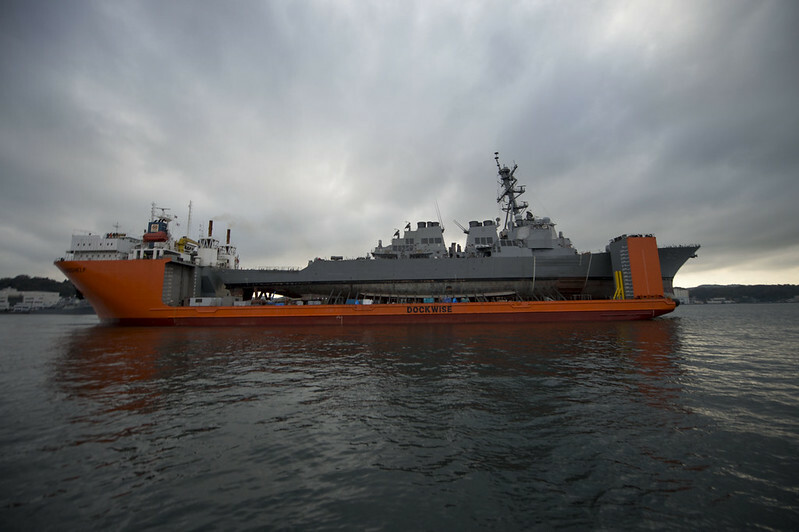 YOKOSUKA Japan - USS Fitzgerald (DDG 62) is scheduled to move into a dry dock on Fleet Activities Yokosuka July 11 to continue repairs and assessments of the damage sustained from a June 17 collision with the merchant vessel ACX Crystal. 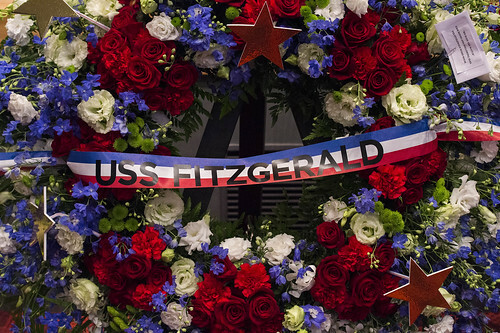 YOKOSUKA, Japan - A memorial wreath is displayed during a ceremony at Fleet Activities Yokosuka for seven Sailors assigned to Arleigh Burke-class guided-missile destroyer USS Fitzgerald (DDG 62) who were killed in a collision at sea, June 17. SASEBO - Cmdr. Bryce Benson and Cmdr. 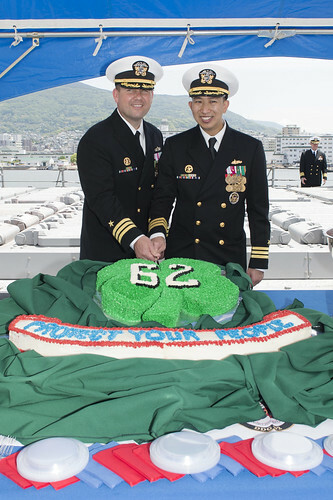 Robert Shu cut a cake after a change of command ceremony. Cmdr. Bryce Benson relieved Cmdr. 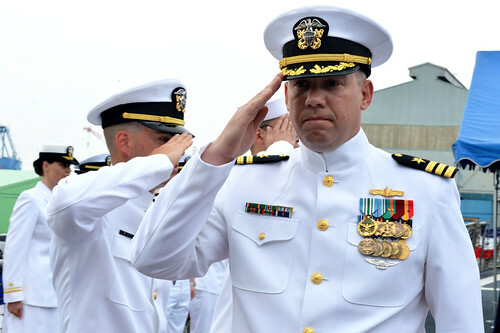 Robert Shu during the change of command ceremony. SUBIC BAY, Philippines - The Arleigh Burke-class guided-missile destroyer USS Fitzgerald (DDG 62) arrived in Subic Bay for a brief port call. 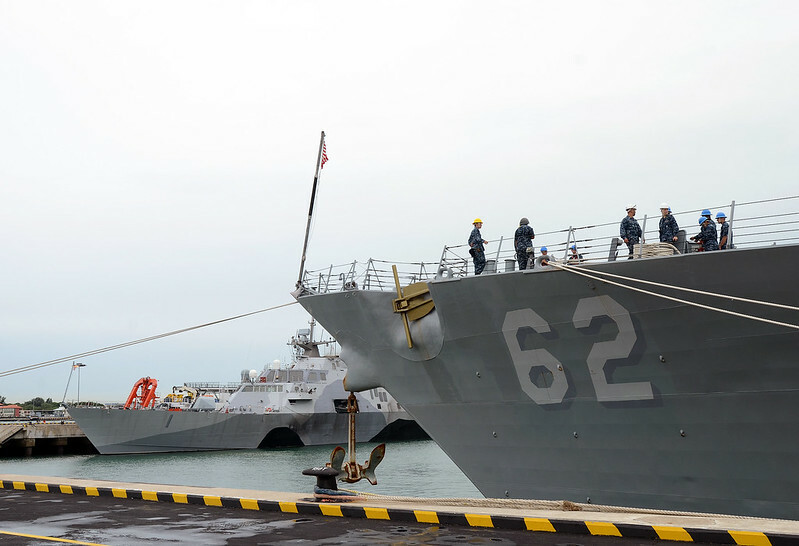 SOUTH CHINA SEA (NNS) – The Arleigh Burke-class guided-missile destroyer USS Fitzgerald (DDG 62) conducted an underway replenishment (UNREP), including a vertical replenishment (VERTREP), March 24. 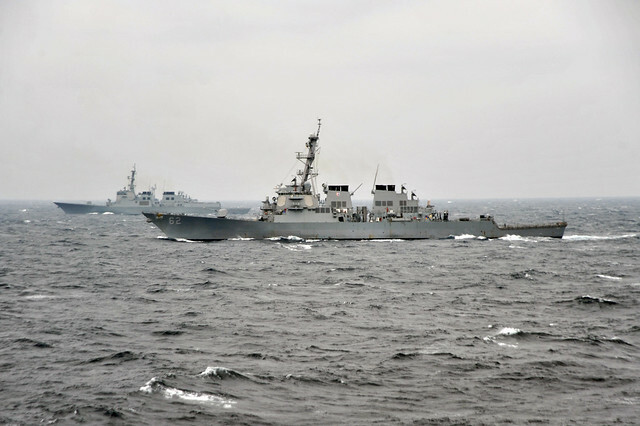 Republic of Korea and U.S. naval ships steam alongside each other during a photo exercise or PHOTOEX. NAVAL BASE GUAM, Guam – The Arleigh Burke-class guided missile destroyer USSFitzgerald (DDG 62) arrived in Guam, Mar. 4. 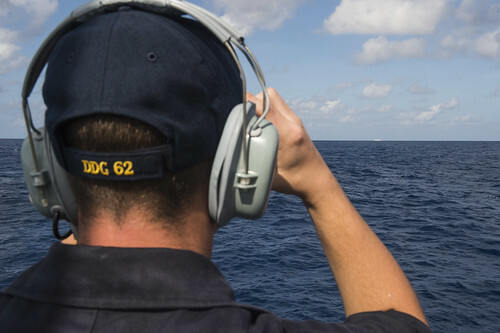 SOUTH CHINA SEA - Seaman James uses binoculars to observe the Peoples Liberation Army (Navy) II-class frigate (FFG 571) from the USS Fitzgerald (DDG 62) as it conducts a routine transit through the South China Sea. 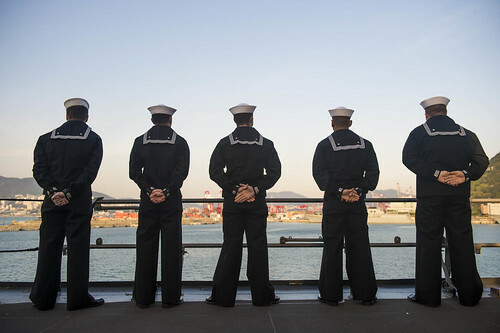 BUSAN, Republic of Korea - Sailors man the rails aboard the USS Fitzgerald (DDG 62) as the ship arrives in Busan. 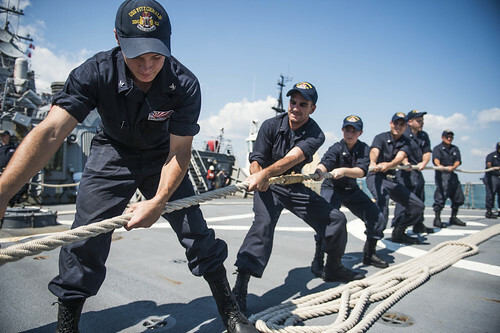 DARWIN, Australia (NNS) - USS Fitzgerald (DDG 62) implemented the Secretary of the Navy's (SECNAV) new initiative to pay husbanding service providers (HSP) during a port visit to Darwin, by using a new process, called Off-Ship Bill Pay (OSBP). 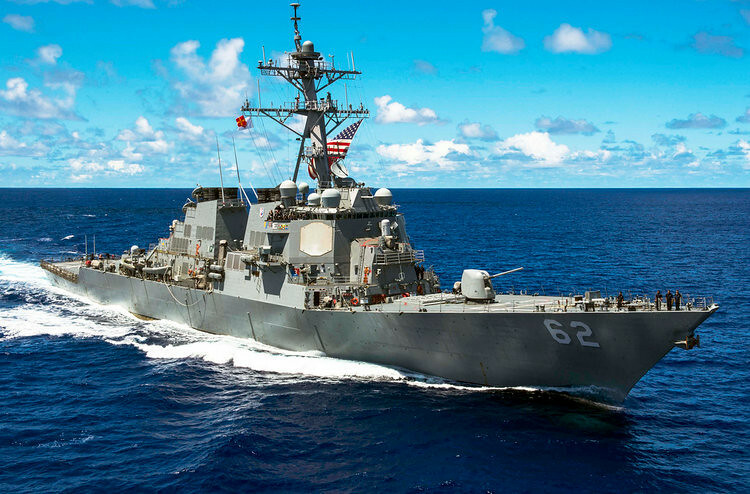 TIMOR SEA – The USS Fitzgerald (DDG 62) participated in an Air Defense Exercise (ADEX) during exercise Talisman Sabre 2015. 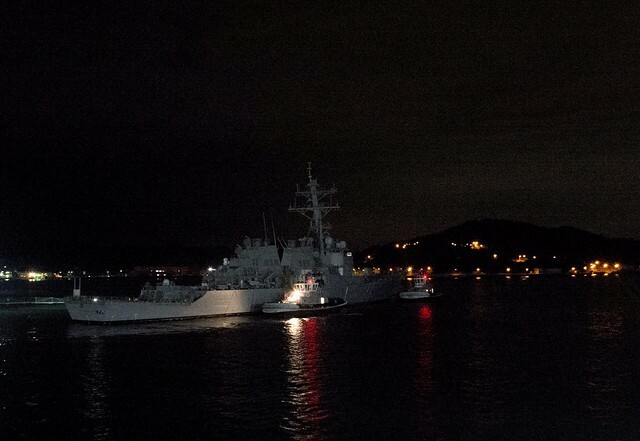 BRISBANE, Australia – The Arleigh Burke-class guided-missile-destroyer USS Fitzgerald (DDG 62) arrived in Brisbane for a port visit. 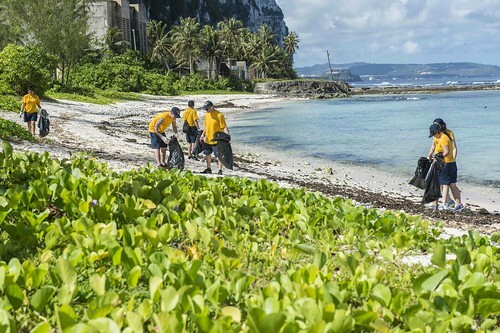 DEDEDO, Guam - Sailors pick up debris at Tanguissan beach during a port visit for the Arleigh Burke-class guided-missile destroyer USS Fitzgerald (DDG 62). 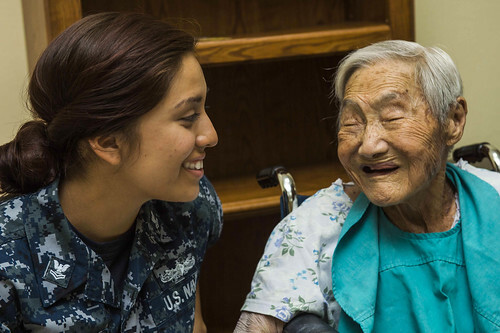 DEDEDO, Guam - Boatswain’s Mate 2nd Class Larissa Hernandez (left), from Belton, Texas, interacts with a patient at St. Dominic’s Senior Care Center during a port visit for the Arleigh Burke-class guided missile destroyer USS Fitzgerald (DDG 62). FUKUOKA, Japan -- Sailors from the Arleigh Burke-class guided-missile destroyer USS Fitzgerald (DDG 62) played basketball with students from The Fukuoka Institute of Technology during a goodwill port visit to Fukuoka. 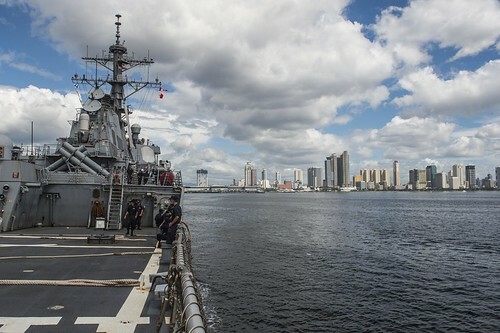 FUKUOKA, Japan -- The Arleigh Burke-class guided-missile destroyer USS Fitzgerald (DDG 62) arrived in Fukuoka, Japan for a goodwill and friendship building port visit. 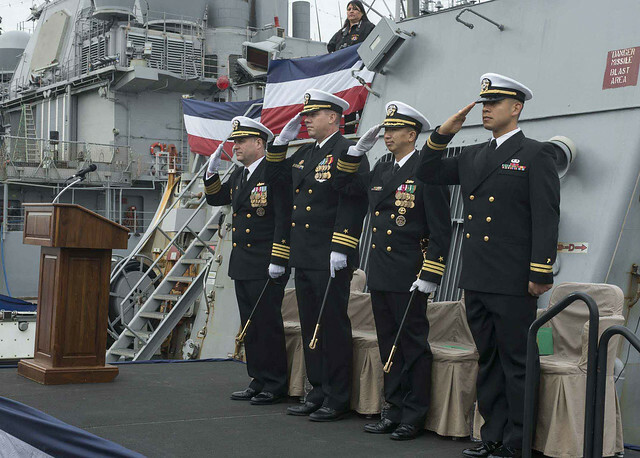 YOKOSUKA, Japan (NNS) -- The officers and crew assigned to the Arleigh Burke-class guided-missile destroyer USS Fitzgerald (DDG 62) ended an era and began a new chapter with a change of command ceremony on the ship's flight deck. 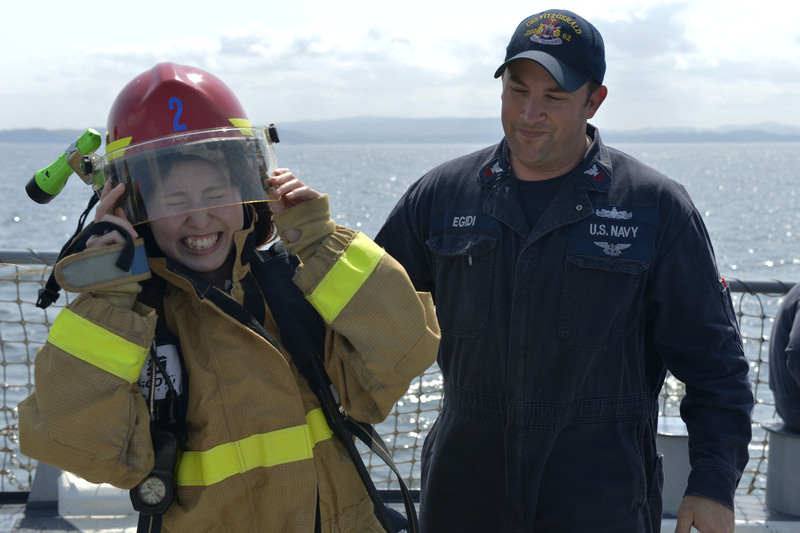 SOUTH OF JAPAN – Friends and families of Sailors assigned to the Arleigh Burke-class guided-missile destroyer USS Fitzgerald (DDG 62) received a firsthand look at Navy life underway during a friends and family day cruise. AOMORI, Japan - USS Fitzgerald (DDG 62) moored in Aomori, Japan for a port visit to the northern Japan city that is in the midst of hosting its annual Nebuta Festival. SINGAPORE - Sailors from the Arleigh Burke class destroyer USS Fitzgerald (DDG 62) and the littoral combat ship USS Freedom (LCS 1) participated in an Independent Duty Corpsman (IDC) subject matter expert exchange. 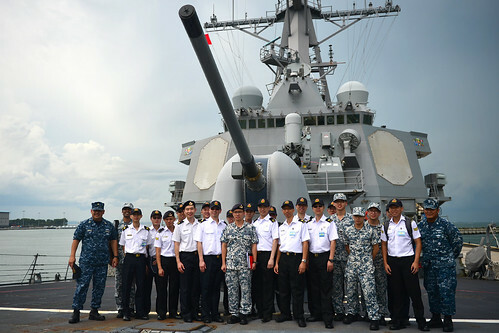 SINGAPORE - Sailors from the guided-missile destroyer USS Fitzgerald (DDG 62) and the littoral combat ship USS Freedom (LCS 1) participated in an Independent Duty Corpsman (IDC) subject matter expert exchange. CHANGI, Singapore – The guided-missile destroyer USS Fitzgerald (DDG 62), right, meets up with the littoral combat ship USS Freedom (LCS 1), left, in Singapore to support Cooperation Afloat Readiness and Training (CARAT) Singapore. SUBIC BAY, Philippines - The 19th annual Cooperation Afloat Readiness and Training (CARAT) Philippines ended with a closing ceremony on board the guided-missile destroyer USS Fitzgerald (DDG 62). SUBIC BAY, Philippines - Cmdr. 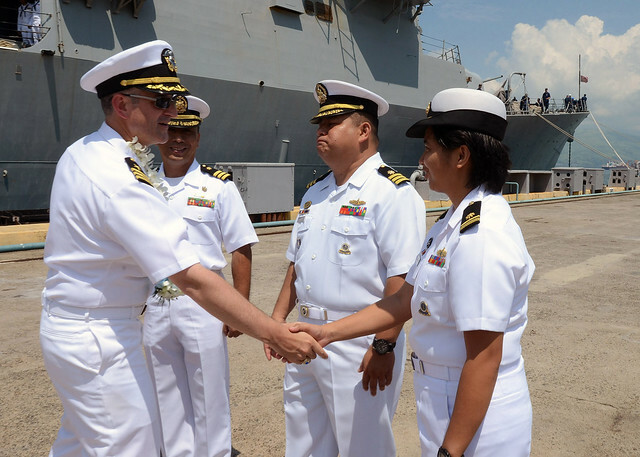 Jonathan L. Schmitz, left, commanding officer of the guided missile destroyer USS Fitzgerald (DDG 62), greets members of the Philippine Navy during Cooperation Afloat Readiness and Training (CARAT) Philippines 2013. 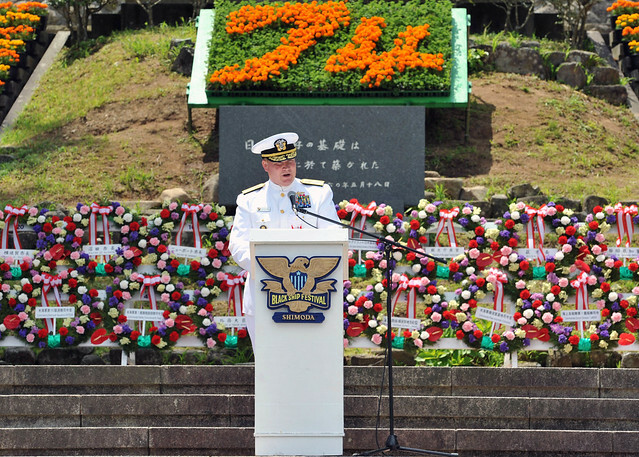 SHIMODA, Japan - Commander, Battle Force 7th Fleet, Rear Adm. Mark Montgomery, speaks at the 74th annual Black Ship Festival commencement ceremony. 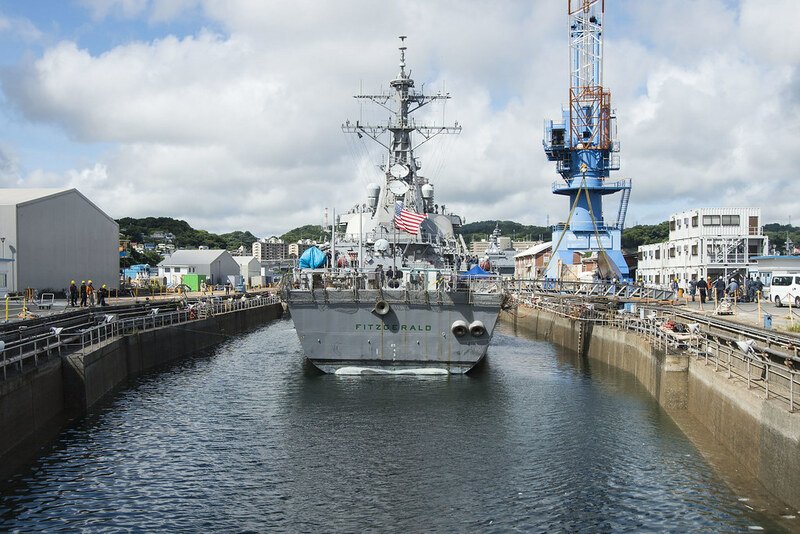 SHIMODA, Japan - Guided-missile destroyer USS Fitzgerald (DDG 62) anchored in Shimoda to participate in the city's 74th annual Black Ship Festival. DONGHAE, Republic of Korea - Sailors from the forward-deployed Arleigh Burke-class guided-missile destroyers USS Fitzgerald (DDG 62) USS Lassen (DDG 82) and Republic of Korea (ROK) navy recently participated in a community service event at Eearae Nursing Home in Donghae, Republic of Korea. Donghae, Republic of Korea - The Arleigh Burke-class guided-missile destroyer USS Fitzgerald (DDG 62) pulled into Donghae for a port visit March 9-13. YOKOSUKA, Japan – The officers and crew of the guided missile destroyer USS Fitzgerald (DDG 62) stood in formation for a change of command ceremony, December 17th along with distinguished guests aboard the ship in Yokosuka, Japan. PEARL HARBOR, Hawaii - The Missile Defense Agency (MDA) successfully conducted the largest, most complex missile defense flight test ever attempted. DEDEDO, Guam - Sailors from USS Fitzgerald (DDG 62) discussed the importance of school, careers and a drug-free attitude to students at Okkodo High School in Dededo. 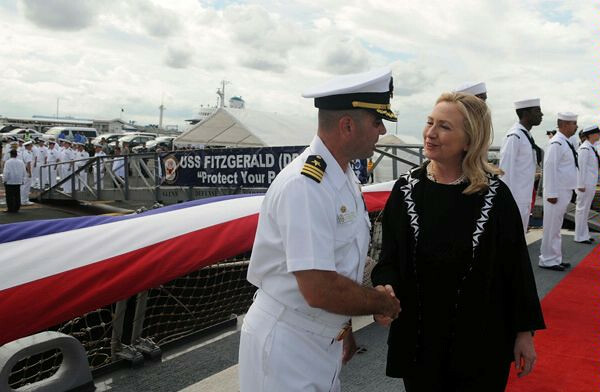 MANILA (Nov. 16, 2011) Secretary of State Hillary Clinton is greeted by Cmdr. Brian Mutty, commanding officer of the the guided-missile destroyer USS Fitzgerald (DDG 62) upon her arrival aboard the ship in Manila Bay to sign the Manila Declaration, commemorating the 60th anniversary of the Philippines-U.S. Mutual Defense Treaty. PHILIPPINE SEA - An SH-60 Sea Hawk helicopter lands on the flight deck of the guided-missile destroyer USS Fitzgerald (DDG 62) during a vertical replenishment training evolution. 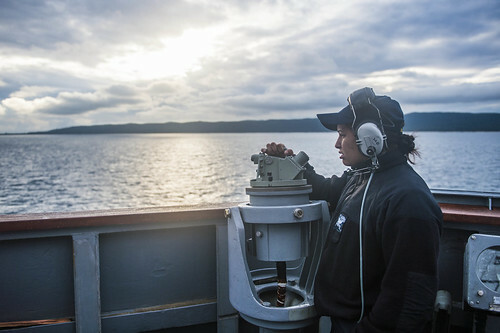 Seaman Recruit Megan Barr, assigned to the forward deployed Arleigh Burke-class guided missile destroyer USS Fitzgerald (DDG 62), looks for surface contacts. PHILIPPINE SEA - Lt. j.g. Cory Massey, assigned to the forward deployed Arleigh Burke-class guided-missile destroyer USS Fitzgerald (DDG 62), talks about the ship's automatic radar plotting aid (ARPA) with Russian Federation navy sailors. The Arleigh-Burke class guided-missile destroyer USS Fitzgerald (DDG 62) departed Vladivostok, Russia on Oct. 4. VLADIVOSTOK, Russia - The Arleigh Burke-class guided-missile destroyer USS Fitzgerald (DDG 62) arrived in Vladivostok, Russia for a port visit, Oct. 1. Cmdr. 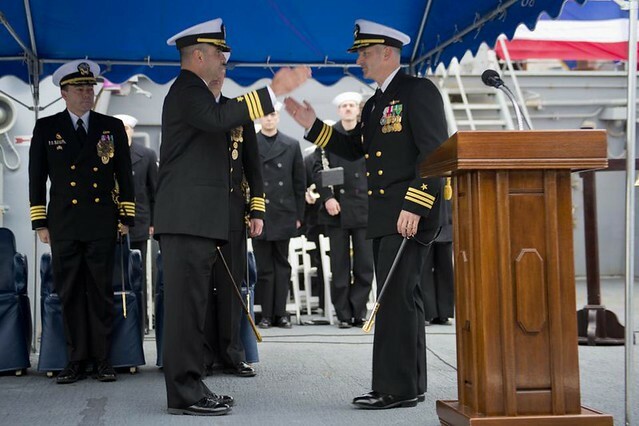 Dennis Velez delivers final remarks to the crew as commanding officer of the guided-missile destroyer USS Fitzgerald (DDG 62) during a change of command ceremony. 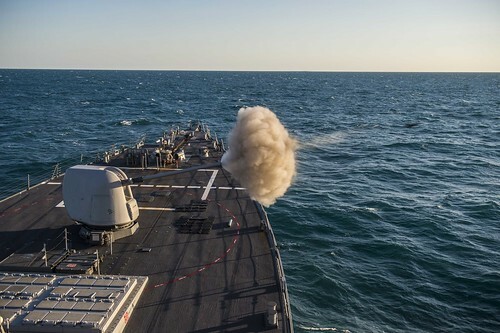 The Arleigh Burke-class guided-missile destroyer USS Fitzgerald (DDG 62) demonstrated its naval surface fire support (NSFS) capabilities during a firing exercise off the coast of Australia July 12-13, in support of exercise Talisman Sabre 2011. USS Fitzgerald (DDG 62) and USS McCampbell (DDG 85) will visit Sydney before participating in Talisman Sabre 2011, a joint-exercise with the Royal Australian Navy. PACIFIC OCEAN (May 26, 2011) - The guided-missile destroyer USS Fitzgerald (DDG 62) tows U.S. Navy tugboat Seminole (YT 805), the first of the new Z-drive tugboats put into service at Commander Fleet Activities Yokosuka. PACIFIC OCEAN (March 25, 2011) – Sailors aboard the Arleigh Burke-class guided-missile destroyer USS Fitzgerald (DDG 62) pass boxes of humanitarian aid supplies to an SH-60 Seahawk while at sea east of the Miyagi Prefecture. PACIFIC OCEAN (Feb. 9, 2011) Ensign Carissa Guthrie, right, and Navy Counselor 1st Class Marshea Taylor check the muster report on the bridge during a man overboard drill aboard the guided-missile destroyer USS Fitzgerald (DDG 62). YOKOSUKA, Japan (Dec. 16, 2010) - Children from Kugo Hokuyen and DC1 Branden Hadley show off their Christmas arts and crafts during a holiday visit from the crew of USS Fitzgerald (DDG 62). USS Fitzgerald (DDG 62) launches a standard missile (SM-2) during a missile exercise near Okinawa. 100413-N-3215T-004 PACIFIC OCEAN (April 13, 2010) The Arleigh Burke-class guided-missile destroyer USS Fitzgerald (DDG 62) launches a standard missile (SM-2) during a missile exercise near Okinawa. 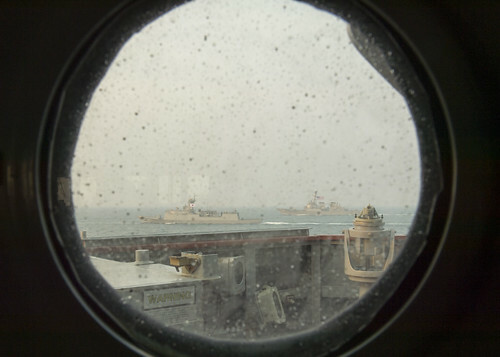 The exercise was one of several training scenarios conducted during Multi-Sail, a semi-annual exercise. USS Fitzgerald - winners of the Navy Battle "E" Award for 2009. Sailors aboard the guided-missile destroyer USS Fitzgerald (DDG 62) completed the Ship Anti-Submarine Warfare Readiness and Evaluation Measurement (SHAREM) 163 exercise Dec. 7, off the coast of Okinawa, Japan. The Arleigh Burke-class destroyer USS Fitzgerald (DDG 62) fires its five-inch 54-caliber MK45 gun during routine training operations off the coast of Okinawa, Japan. 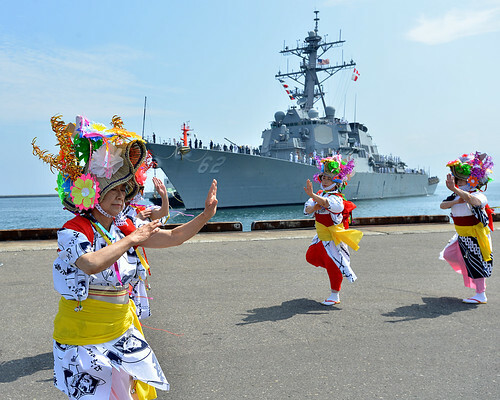 The forward-deployed Arleigh Burke-class guided missile destroyer USS Fitzgerald (DDG 62) arrived in Qingdao, People's Republic of China, April 19, for a scheduled port visit and to take part in the 2009 International Fleet Review.